Welcome to the John Damberg Latin Jazz Quintet home page! Please check out our site, and enjoy some of our music! 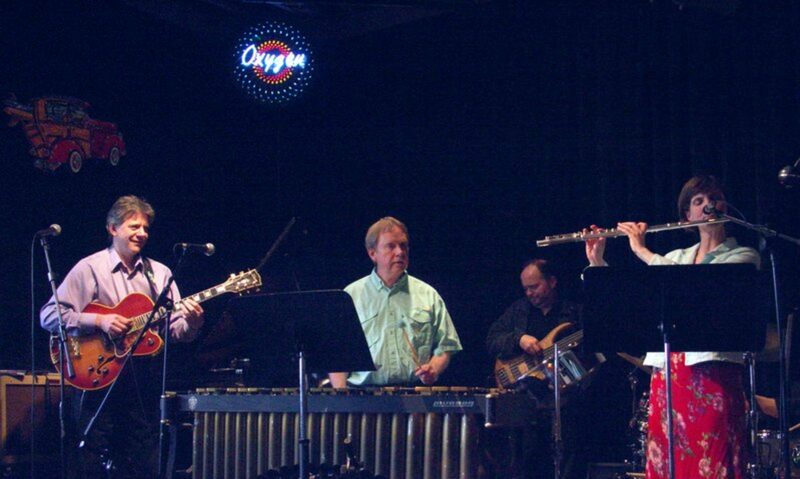 Let your body move and your mind travel to the warm and sunny islands of the Caribbean, where the music is rich with exotic, fiery melodies and the exciting rhythms that are the musical Pastiche of the John Damberg Latin Jazz Quintet! The group features the original music of noted Alaska composers/performers and educators John Damberg and Mark Manners. Their musical compositions, influenced by the music of Brazil, Cuba, Trinidad, Mexico and Puerto Rico, will take you on a delightful musical journey through the Caribbean Islands and the countries of Latin and South America. The Ensemble’s tight, swinging arrangements highlight the musical artistry of Alaska’s own John Damberg on marimba, vibes and steel drum, Laura Koenig on flute, and Alaskan guitar artist Mark Manners. Adding heat to the band’s Musical Salsa is the ever Hot groove of the band’s rhythm section, which includes Bob Andrews on bass and Cameron Cartland on drum set and Latin percussion. Please check back for new updates!